Home Blog Help Hosain this Christmas – Your Gift Will Be Doubled! For months, seven year old Hosain hasn’t been able to walk to school or run and play with his friends in his village just outside the city of Chittagong in Bangladesh. The weakness in his foot came on over the course of a few weeks. Gradually becoming a pronounced foot-drop. John, the Program Leader for The Leprosy Mission in Chittagong, told me that his family thought the problem was a supernatural one. The Imam, who knew nothing about leprosy, “treated” him for three days but there was no improvement. Please give what you can to help children like Hosain this Christmas. A gift of £25, doubled to £50 could train and support community representatives to be there for children like Hosain. They can be looking out for the potential early signs of leprosy and training others in the community, perhaps even including the Imam, to recognise it and know where to send someone like Hosain for the help they need. Hosain’s father tried again to get help for his son. He took him to a government doctor. The doctor took x-rays, admitted Hosain to hospital and gave him drugs for a week. Again there was no improvement. You can change things across the whole city this Christmas. Your doubled gift could provide training to doctors, nurses and health centre staff across the city to know how to diagnose and treat someone affected by leprosy properly. On the advice of an aunt, Hosain’s father took him to an orthopaedic specialist who referred him to a skin specialist who turned out to be the first person who knew how to help. The skin specialist had been trained by John’s team and referred Hosain to a clinic run by The Leprosy Mission at Chittagong Medical College Hospital. He finally had an answer to what was wrong with his foot. Leprosy. He has started on the drugs that will cure his leprosy as well as physiotherapy and medication to help strengthen his foot. The team will visit him at home to give further help and make sure he is recovering well. Please give what you can this Christmas to give Hosain the help he needs for as long as he needs it. Please give so that one day Hosain can walk to school and run and play with his friends once again. 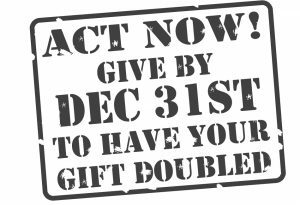 Your Christmas Gift Will Be Doubled! A small group of generous supporters have agreed to double your gift pound-for-pound. For every pound you give, they will give the same, up to a total of £14,500. Gifts received above this level will not be doubled.